I’m also a big James Riley fan and this will be a must read for me. I did like the humor in his other series, but you have me prepared to not expect too much here. Thanks for the intriguing review. I haven’t read anything by James Riley, but the magic systems sounds intriguing. Glad you liked it so much. I have only read the Story Thieves and liked it. 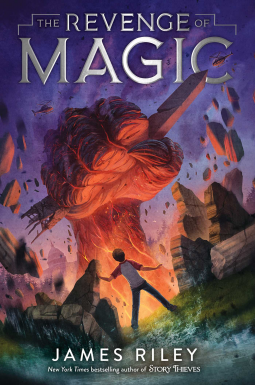 The way magic is used intrigues me, so I will probably check out this book. Enjoyed your review. I haven’t read anything by this author- though I have seen his books around. I love the cover of this one and the story sounds like one I will really fall into. Knowing it ends on a cliffhanger- I will probably wait until the next book is out, as I have a hard time waiting on that cliff. 😉 Thanks for sharing! Well … there are going to be seven books, and I bet he will leave a cliffhanger for every one, just so you know :). I just don’t read a lot of fantasy, but I’ll bet my granddaughter might like this. Thanks for the review. oooh! This looks like a series I will want to read!